And here’s me. Born September 20, 1948 in Bayonne, New Jersey. I arrived short one “R” but fixed that at my confirmation thirteen years later. I was the oldest of three, with two younger sisters. I did have lots of other relatives: a grandmother, a great grandmother, a great aunt, a great uncle, various other aunts and uncles, hordes of cousins on both sides. For the first four years of my life my parents lived with great grandmother in an old house on Broadway and 31st Street in Bayonne. This is me playing in the backyard. TV was full of cowboys in those days, some with one gun and some with two. 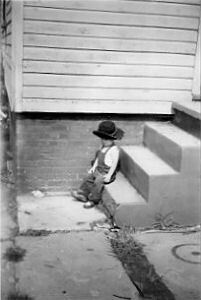 Some kids played at being Roy Rodgers, some preferred Hopalong Cassidy. I played a cowboy of my own creation, whose name was “Lotsa Guns.” (Most of them were sticks). Two years after my arrival, my parents had a second child. 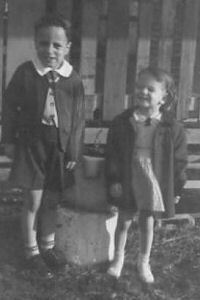 This is me with my sister Darleen. I don’t know who dressed me like that, but someday I am going to have to hunt them down. Good thing I didn’t know any other children. 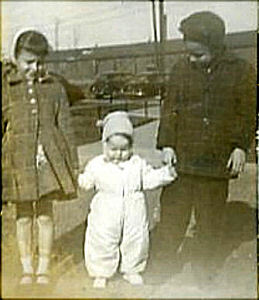 I was four and Darleen was two when my parents moved out of Grandma Jones’s house and into an apartment of their own in the brand-new low income housing projects on First Street. “LaTourette Gardens,” the place was called. Not exactly Cabrini Green, they occupied the former site of a famous 19th century hotel, looking out over the Kill Van Kull toward Staten Island. Our building was directly across the street from Brady’s Dock, which my mother’s grandfather had built. This photo (taken a couple of decades later) shows 35 East First Street, where I would live from age four to age eighteen. For the first few years we lived in apartment 114 in the back, but when my sister Janet came along we moved into apartment 116, whose living room windows faced the street, the little park you see in foreground here, and the oily, polluted waters of the Kill. Ah, first communion. A wonderful occasion. 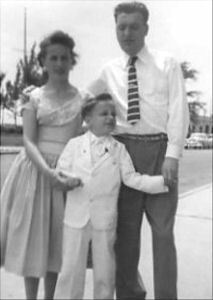 All your sins get washed away, you have a party with cake and ice cream, and your parents get to go out and buy this white suit that you’ll never wear again. Yes, I was born Catholic, like almost everybody else in Bayonne. 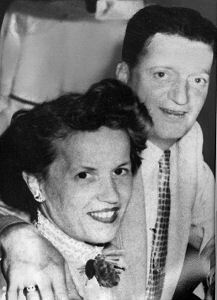 Back then, a “mixed marriage” was when an Irish Catholic married an Italian Catholic. 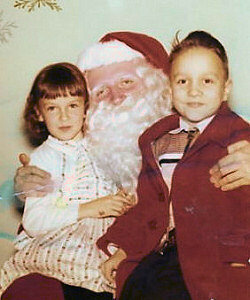 A couple of the five-and-dime stores in Bayonne had Santas, but every once in a while my parents would take Darleen and me on the bus into New York City to see the real Santa at Macy’s. No, I don’t remember if I got what I wanted for Christmas that year… but I usually made out pretty well. One year I got a Marx medieval playset complete with tinplate castle and lots of knights, and there were cool space toys as well. 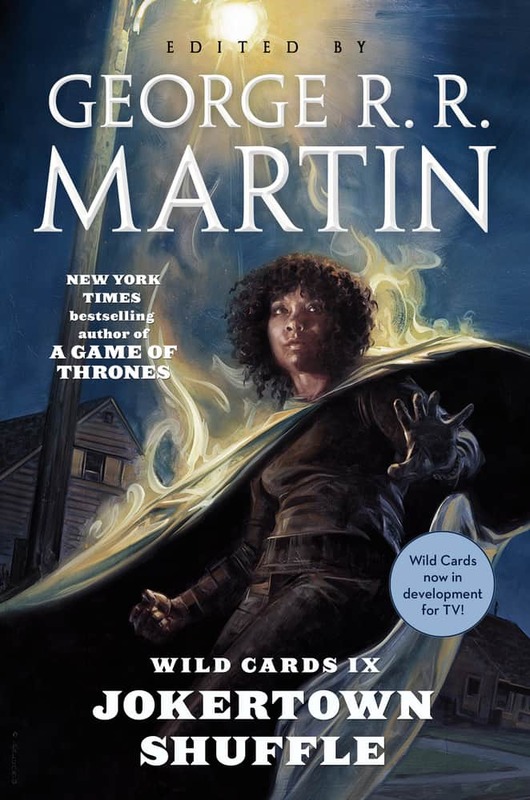 The Miller aliens prompted me to make up a whole series of stories about Jarn of Mars and his band of space pirates, and the Marx castle housed my pet turtles for years and eventually inspired my first epic fantasy tale (just like A Song of Ice and Fire, except all the characters were turtles). My younger sister Janet arrived seven years after me and five years after Darleen. Our apartment only had three bedrooms, so my mother said if the new baby was a boy, I’d have to share my room with him, while a girl would share with Darleen. Naturally, I rooted for a sister. I won, and got to keep my room. Here’s the three of us together. Janet is the short one. 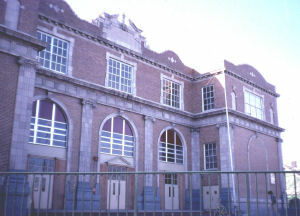 Mary Jane Donohoe School — also known as #4 school — was where I went to grade school, from kindergarten through eighth grade. The school was on Fifth Street and my family never owned a car, so I walked those four blocks every day. I had to pass St. Andrew’s on the way, the Catholic grade school. 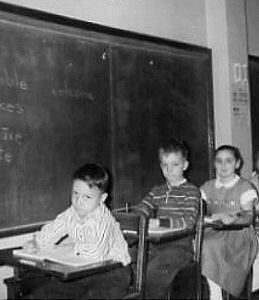 The city was so Catholic that the parochial schools had classes twice the size of the public schools. 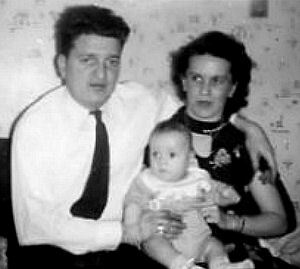 My mother figured I would get a better education in a smaller class, so she sent me to Mary Jane Donohoe… even after a parish priest came by the projects to warn her that if she persisted in her folly, she and I would both surely go to hell. (This picture was taken a decade or so after I graduated. When I was there, the bare concrete schoolyard in the foreground was still dirt, and full of trees and bushes). Mrs. Hussey’s third grade class at Mary Jane Donohoe School. That’s me in the first desk, with my friend Raymond Karol just behind me. Behind him is Joanne Grillo, the smartest girl in the school. Years later, I danced with her at her Sweet Sixteen party. A first for me. 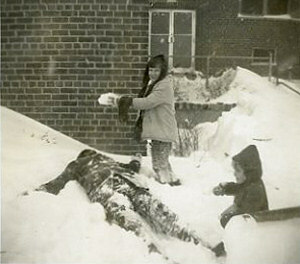 Snow is always a lot of fun when you’re a kid, and we got a fair amount in New Jersey back in the ’50s. Snow forts and snowball fights were part of every winter, and when they were done, you had to bury the dead, as my sisters are doing to me here. 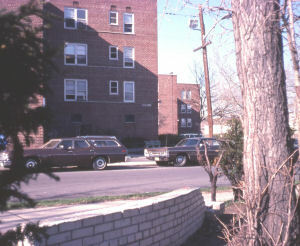 This was in front of the projects at 35 East First Street; on the upper right you can see our living room window, which looked out over Brady’s Dock and the Kill Von Kull. We did not have junior high school or “middle school” in Bayonne when I was growing up, just grammar school and high school, so I stayed at Mary Jane Donohoe School through 8th grade and graduated in June of 1962. Somehow I ended up as the class valedictorian. 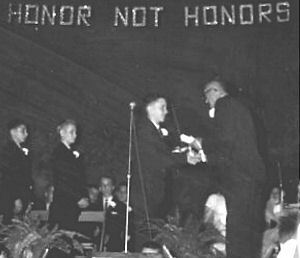 “Honor, Not Honors” was the school motto. Maybe that’s where Eddard Stark came from. 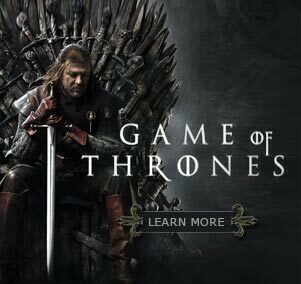 I should really borrow that motto for one of the noble houses of Westeros. And here he is, the graduate, Mary Jane Donohoe Class of 1962. As a graduation present I got a television set of my very own, which meant I could watch cool stuff like The Twilight Zone and Thriller even when my father wanted to watch a football game or an old western. That fall, it was off to high school. 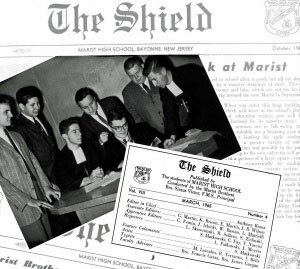 My parents decided to send me to a Catholic prep school, Marist High, which had just opened a new campus on 57th Street hard beside the waters of Newark Bay, in what had previously been the county reform school. Since we lived on First Street and Marist was clear at the other end of Bayonne, that meant a couple of long bus trips every day. The really bad part, though, was that Marist was a boy’s school. Aside from my sisters, I hardly spoke to a girl for the next four years. My four years at Marist High School were not the happiest of my life. Aside from discovering that I had absolutely no gift for foreign languages (I struggled mightily in both Latin and French), I did well enough with the academics, but my real passions were for chess, comic books, and writing. I captained the Marist chess team my senior year. Sophomore and junior years I wrote and edited for the school paper, until getting thrown off early senior year in a censorship dispute. (This yearbook photo is from junior year, when I was still an editor). 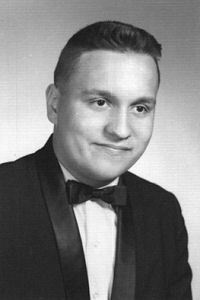 High school was also when I got involved in comic fandom, began publishing amateur superhero stories in the fanzines of the day, and started corresponding with a fellow fan in Texas, a kid named Howard Waldrop. 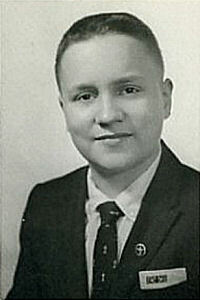 I graduated from Marist High School in 1966, and headed off to college. I had been accepted at several local schools, but after spending my entire life in Bayonne watching the big ships go up and down the Kill Van Kull and dreaming of distant lands and far horizons, I was eager to finally see a bit of the rest of the world. I chose Northwestern University in far off Evanston, Illinois, just north of Chicago. It would be the furthest I had ever been from home. I made my first trip out there on a Greyhound, with three brand new suitcases (a graduation present) and an old typewriter to keep me company.